Located close to all the amenities Gretna has to offer including shops, GP surgery, Primary schooling, railway station and the popular Gretna Gateway Outlet Village. Comprising of a spacious Lounge open to the Dining Area, Kitchen, Master Bedroom with En Suite Shower Room, Two Further Double Bedrooms and Family Bathroom. Outside there is off road parking, a garage and enclosed gardens with lawn and patio areas. Benefits from gas central heating and double glazing throughout. We can provide a realistic, FREE valuation of your current property. Give us a call on 01461 205690 to arrange a day and time that's suitable for you! Loft access. Coving, two ceiling lights, two storage cupboards. Telephone point. Radiator, carpeted flooring. Coving, ceiling light, radiator, carpeted flooring. Patio doors with curtain pole leading to garden. Windows to side and rear with curtain pole and blinds. Coving, two ceiling lights, smoke alarm. Range of wall and base cabinets, integral oven and four ring gas hob, extractor fan. Stainless steel sink and drainer with mixer tap, tiled splashback. Plumbing for washing machine and dishwasher. Space for fridge and freezer. Radiator, vinyl flooring. Door to garden. Window to front with curtain pole and blinds. Coving, ceiling light, built in wardrobe. Radiator, carpeted flooring. Window to side. Ceiling light, extractor fan. Fully tiled walls. Toilet, wash hand basin and shower cubicle with electric shower. Radiator, carpeted flooring. Window to front with curtain pole and blinds. Coving, ceiling light, fitted furniture. Radiator, carpeted flooring. Window to rear with curtain pole and blinds. Coving, ceiling light, built in wardrobes. Radiator, carpeted flooring. Window to side with curtain pole. Recessed lighting, extractor fan. Panelled ceiling and boarded walls. Suite comprising of toilet, wash hand basin and Jacuzzi bath. Radiator, carpeted flooring. Front garden with lawn and mature planting borders. Driveway and garage (with electrics) at side and rear. Enclosed rear garden with lawn, patio and mature planting sections. Rotary clothes drier. Greenhouse included in sale. 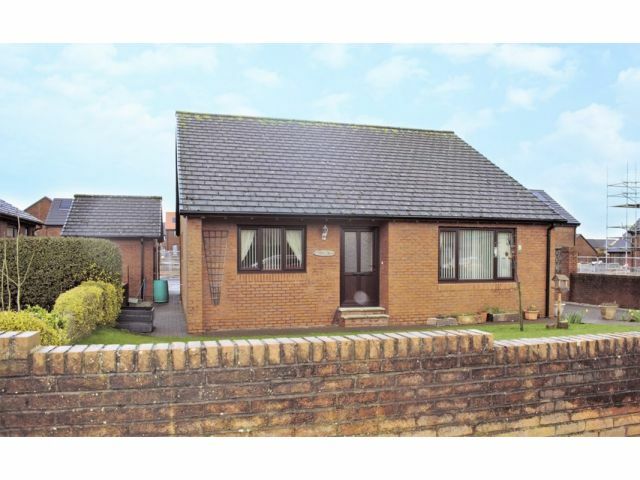 Offers in the region of £170,000 are invited and should be submitted to lj Residential, 93 High Street, Annan, DG12 6DJ or by fax to: 01461 205037.